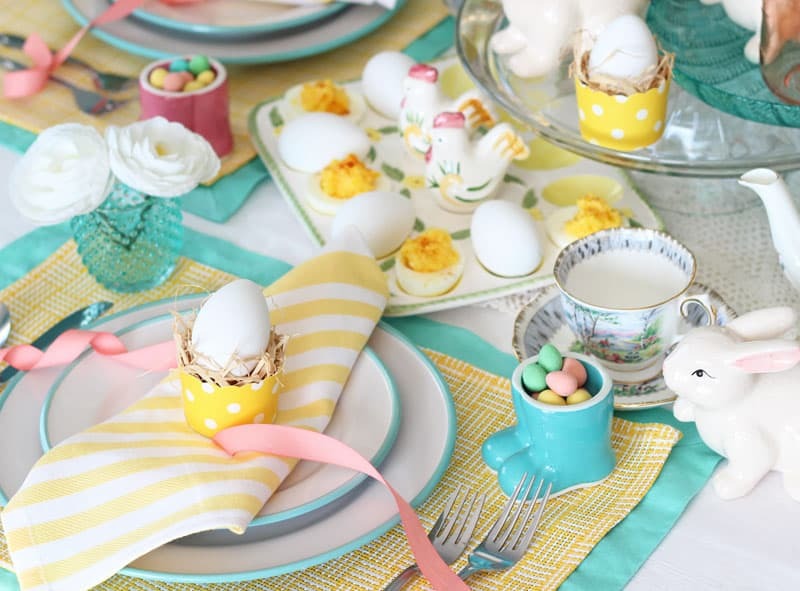 Today I have a special treat for you, not only do I have a sweet Easter tablescape to share, but I’ve teamed up with a small group of amazing bloggers you can hop along to get all the inspiration you need to host an entire dinner party! 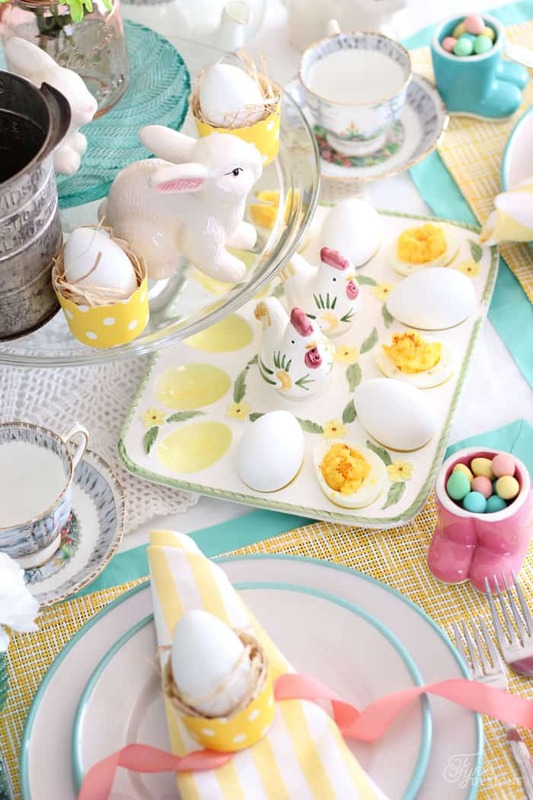 This Easter tablescape is quite simple and packs a pretty Spring punch. I used a few things I had around the house, and added a few new things I picked up at the grocery store! Presidents Choice has some great spring colors in their home decor section this season. I’m sure if you poke around your house you can find some items you can repurpose to achieve a similar look. I do own a few little egg cups, but not enough to host more than 2 or 3 people. To keep the look cohesive, I decided to use these paper muffin cups with a little bit of raffia, a whole sleeve was only $2! 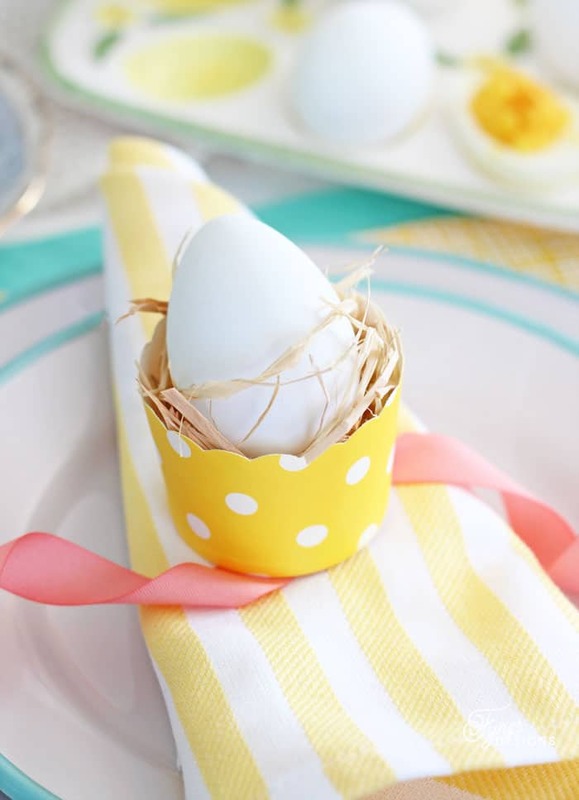 Your guests can put their egg shell right in the cup once they begin to eat. 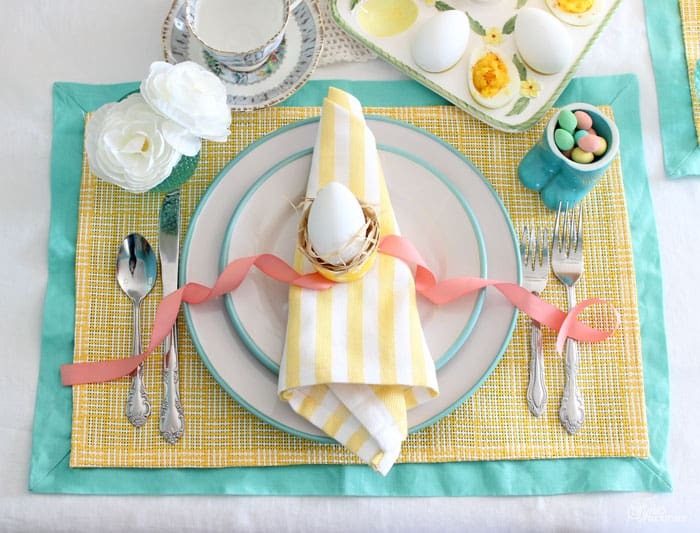 I had planned to tie the ribbon around the napkin, but the strand with a little curl gave the table a pretty pop of color. I always want to use a nice set of cloth napkins when hosting a dinner party, but buying new for every occasion can get pricy (and depending on what you’re eating they are really prone to stains), so to get a set of coordinating napkins on the cheap I bought 3 tea towels that cost only $7, and cut each in half, then hemmed the edge. It makes a rectangle napkin, but it lays on the lap better anyhow! I had this set of teal linen placemats for sometime, but honestly never used them because no matter how much I steamed them they always looked like I slept on them first. By placing a $2 plastic canvas placemat on top it gave some great layering, keeping the color without the wrinkles. Since there is still mountains of snow here, and no floral sign of spring in sight, I went with some fake posies. Only a few dollars spent, and I can use them over and over! 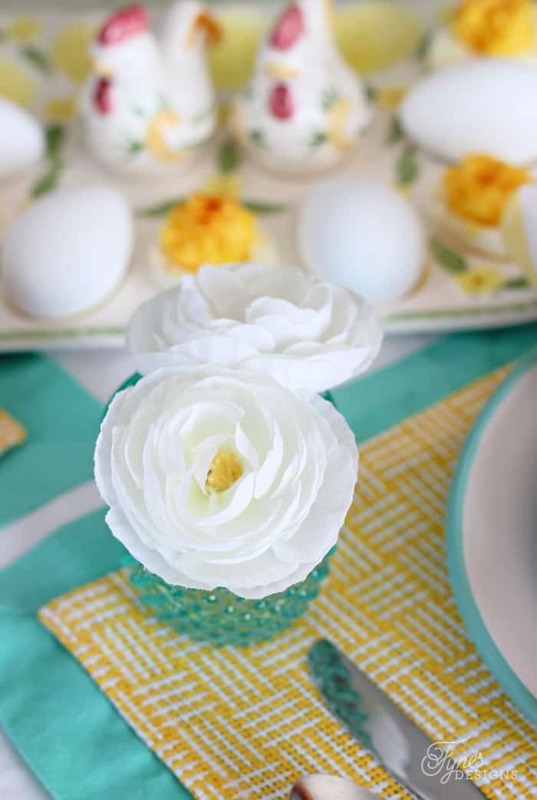 Adding in a few vintage dishes completes this easy Easter place setting! 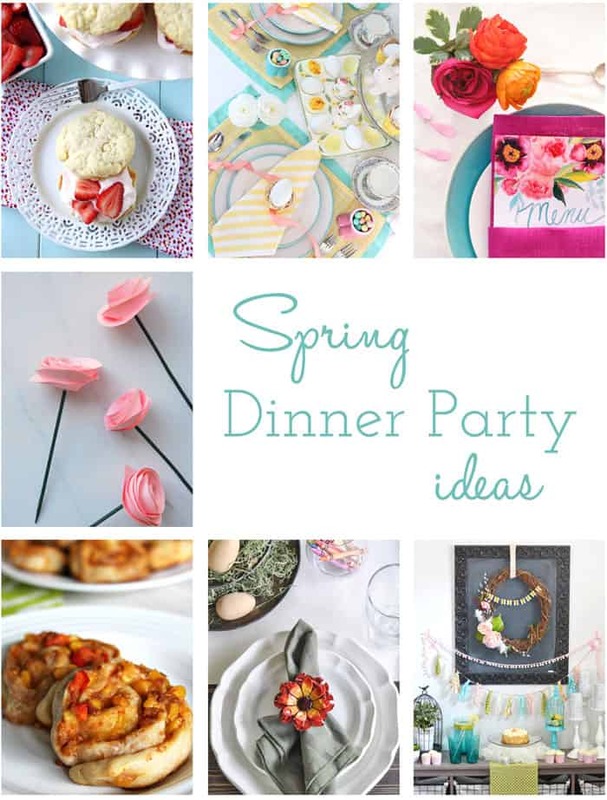 Now it’s time to check out more Spring Dinner Party ideas from these amazing gals! I’d love it if you would check them out and support their incredible talent! Enjoy! I don’t know about you, but’ I’d love to be a part of this beautiful party! Happy Spring! What a beautiful table setting, Virginia! Of course I’m IN LOVE with the colours (our posts totally match today – hooray! 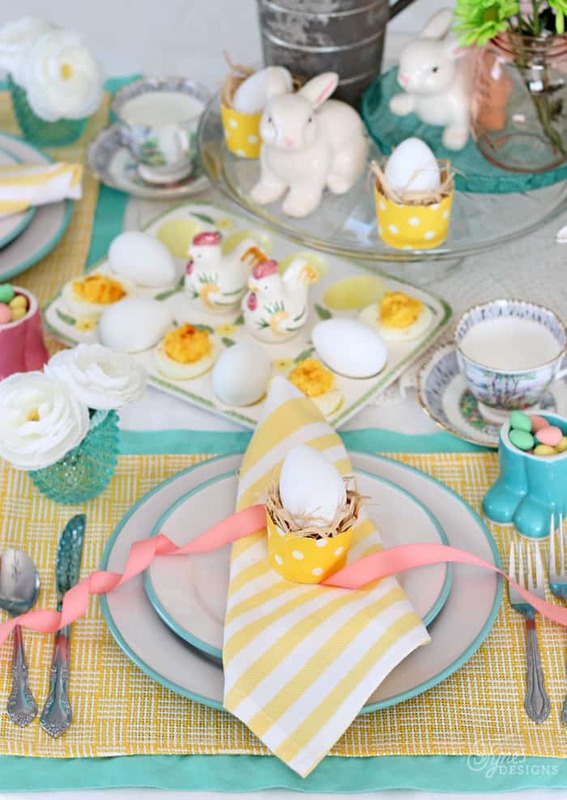 ), and the idea of using muffin wrappers for egg cups is awesome. I personally like the look of wrinkled linen, and the way you’ve styled it is so pretty. What a beautiful table Virginia! 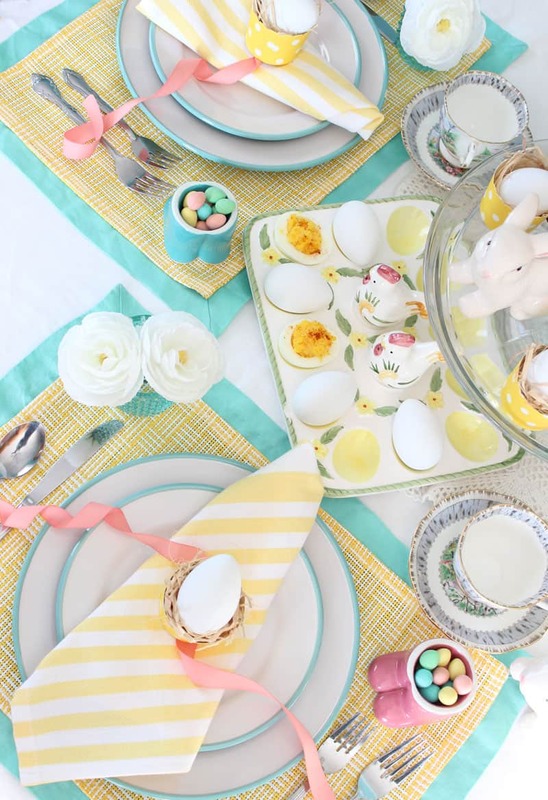 I love all the yellow & aqua…so pretty! Happy Easter! So pretty! You always have such a beautiful way with color. I love those little rain boot candy holders – SO cute! Virginia – this is gorgeous! It’s so light and bright and fussy in just the right places. I want your chicken/rooster salt and pepper shakers. And great idea with the cupcake wrappers – I’ll have to remember that! This is striking! Makes me feel special having an Easter birthday! I hope my dinner party coms out half this beautiful! Amazing decoration. This table looks so cheerful and beautiful. I will try this next year.